Occasionally they come with a name, but not always with JoomlaJet and this month is one of those times. But I'm assured they did spend hours coming up with the number! 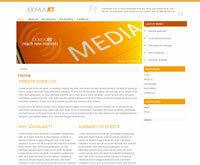 You might not always get a name with JoomlaJet but you always get quality. This one is a very clean and minimal theme and if you're looking for a site that just, looks good, then this is one to look at. The theme is fully table less, XHTML and CSS compliant. The customisation of this theme is also easily done by simply changing colours in the CSS file and the Photoshop source file that is provided. Click here for more information or if you're a member of JoomlaJet you can download it straight away.